The N300 million suit slammed on the Inspector-General of Police, Ibrahim Idris, and three others by suspected billionaire kidnapper, Chukwudumeme Onwuamadike (also known as Evans), challenging his continued detention was on Tuesday adjourned till September 21. Justice Chuka Obiozor of the Lagos Division of the Federal High Court while adjourning the matter held that there was no urgency for the suit to be heard during the court’s vacation. The judge, who is sitting as a vacation judge, held that the arraignment of Evans before the State High Court, last week has relaxed the urgency in the suit. Evans pleaded guilty to two counts of conspiracy and kidnapping when he was arraigned before a judge last week. In the fundamental rights enforcement suit he filed before a federal court, Evans through his lawyer, Olukoya Ogungbeje, had attached an affidavit of urgency as he sought a court order directing the police to charge him to court immediately or release him on bail if they are not ready for prosecution. The alleged kidnapper had been in police custody since June 10. 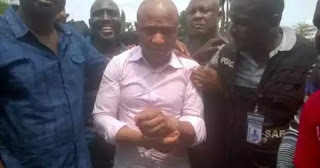 In the suit, Mr. Ogungbeje had argued that Evans’ detention without being charged to court was a violation of his client’s fundamental rights enshrined in Sections 35 (1) (c) (3) (4) (5) (a) (b) and 36 of the Constitution. For his alleged unlawful detention without being charged to court, Evans wants the court to award N300 million damages against the police in his favour. Other respondents in the suit are the Nigerian Police Force; Commissioner of Police, Lagos State; and the Lagos State Anti-Robbery Squad. Another vacation judge, Abdulaziz Anka, had earlier fixed August 29 to deliver judgement, but a fresh application by the police caused the judge to reschedule to a later date. But on Tuesday, Mr. Obiozor held that there was nothing urgent in the matter anymore due to the latest development on the matter and adjourned till September 21 for further proceedings.